Villa Štefanija is an intimate four-star villa that offers an unforgettable stay in a peaceful and silent oasis. Luxury, comfort and quality distinguish all our services, which are tailored to meet the individual needs of each guest. • Wellness zone: Jacuzzi for four, dry sauna, and relax room with deck chairs. • An open-air swimming pool: Situated next to the villa, the pool will cool you down during the summer days or immediately after the sauna. The big terrace near the swimming pool is ideal for sunbathing and relaxing while enjoying the view of countryside and the smell of aromatic plants. • Visit to Wine Bar - Enoteca Istriana: Our guests have the option of visiting our Enoteca Istriana in the old city of Pula, located right in front of the Temple of August (a well-preserved Roman temple). The wine bar and shop offers a rich variety of high quality Istrian wines, grappa and oils. Visits are arranged at no cost. Villa Štefanija has also a private entrance in case you would like complete privacy. Our villa offers an unforgettable view from each perspective. On most days you will be able to see the nearby islands of Cres and Losinj,as if you were holding the Kvarner Bay in your hand. In the night you will admire the sky filled with stars. 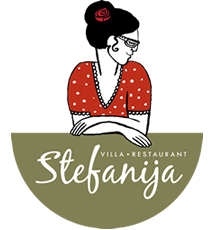 Villa Štefanija assures privacy to all our guests, a guarantee of a pleasant and outstanding holiday.